Petrol generators for sale at factory direct prices. Home Portable Generators petrol or diesel portable generators are perfect for a backup house power supply. Trade & Industrial Portable Generators, our trade and industrial series of portable generators from 2.8KVA to 10KVA are reliable and durable for demanding work. 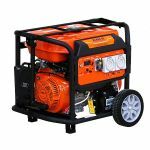 We have a petrol generator for sale, portable generators, to suit your needs whether it's a portable petrol generator for camping, backup petrol generator for your house or solar system, or an industrial petrol generator power source. Perhaps you're looking for a quiet camping generator, portable generators or diesel generator? Give us a call on 1300 793 001 for the right advice and price on a portable petrol powered generator. Call us to discuss your petrol generator or Inverter Portable Generators questions. Portable generators are typically not capable to run for extended periods of time at maximum load because of their simpler design. Off grid petrol generator sales offices in Perth, Brisbane and Melbourne. Ablesales are very well known for generators in Australia, having over 10 years of design improvements and with customers all over the world using our machines. Because Ablesale design their own machines buying one is like buying direct from the wholesaler. Not sure which one to buy? give our friendly sales staff a call. As a general rule of thumb, the bigger the operation the greater the need for a diesel generator. Petrol generators are ideal for small-scale projects, like providing power for a camping trip or even running a small hobby farm, while in contrast, the enhanced muscle and efficiency of a diesel generator makes it the genie of choice for larger-scale operations. Besides the cost of petrol being cheaper than diesel, there are a few pros for petrol. There is more choice of models for petrol generators. This is because petrol generators have been around for longer. However you’ll find a growing selection of diesel generators for a whole range of applications and budgets at Ablesales ranging from home/business backup, trade/construction applications, solar set up backup, events and much more. While diesel generator are more fuel efficient, petrol generators are now being build with all kinds of economy modes and features. Petrol is much more volatile than diesel. So if you’re carrying lots of fuel for your generator, diesel is a safer option. Petrol generators requires more maintenance than a diesel generator. Another downfall of petrol generators is that they reach a higher temperature than their diesel counterparts. This leads to more wear and tear on the generator parts over time, meaning more frequent maintenance and repair, and ultimately, a short lifespan. As a result, petrol generators are not usually run at high loads for extended periods. If you are looking to use the generator for heavy commercial use, then diesel is the way to go. But if you are already operating other equipment with petrol, for an emergency backup or holidays use, then a petrol generator is for you. It really comes down according to your needs. "As an ex-professional engineer I am rarely impressed by the quality of products and the service..."